Randy Huynh is a member of the B.E. A S.H.E.R.O Technology Committee. He works on website material, graphics, photography, and event logistics. 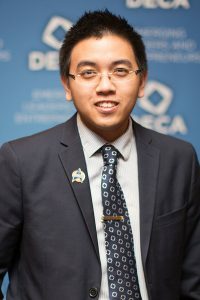 Nicholas was born and raised in Las Vegas and attended the University of Nevada, Las Vegas, graduating with a Bachelor’s of Science in Computer Science and a minor in Global Entrepreneurship. While attending college, Randy volunteered with DECA and served as a former president of UNLV Collegiate DECA. Service is important to Randy and he has made it a regular part of his life. He has volunteered with other local organizations including: OCA, and Asian Community Development Center. Randy has been honing his website creation skills for the past five years, assisting a number of different agencies with their online content. He is currently working for a Las Vegas startup company that has recently been recognized by Forbes as the leader in premium natural deodorants. Randy is very busy with his job and volunteering, but in his free time he loves reading, gardening, and repairing broken items within his home.